The Media Foundation has invited nominations for its annual Chameli Devi Jain Award for an outstanding woman media person for 2018. 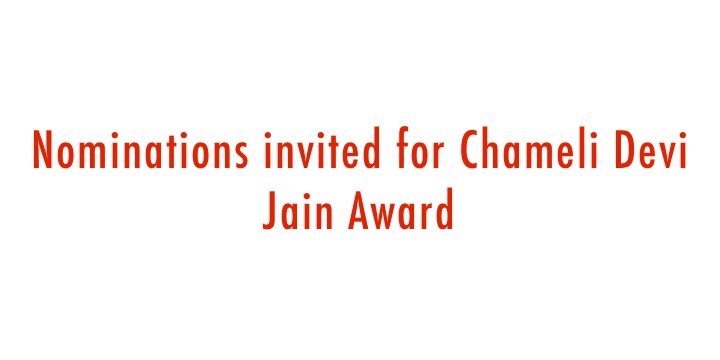 The annual Chameli Devi Jain Award is the premier award for women media persons in India. It was first awarded in 1982 to an outstanding woman media person, who had made a difference through writing with depth, dedication, courage and compassion. Chameli Devi Jain awardees include some of the best known and respected names in Indian journalism. They have pioneered and popularised a new journalism in terms of themes and values – such as social development, politics, equity, gender justice, health, war and conflict, and consumer values. The success of the annual award was largely due to the dedication and commitment of the late Mr BG Verghese, a standard bearer of the profession, of unwavering principle and intellectual curiosity. The criteria for selection are excellence, analytical skill, social concern, insights, style, innovation, courage and compassion. Other things being equal, preference will be given to small town/rural, Indian language journalists and those who have not been awarded before in their careers. A statement issued to the media said that entries can be sent in English, Hindi or any other Indian language. The entries will be evaluated by an independent panel of jurists whose verdict shall be final. Journalists in the print, digital, broadcast and current affairs documentary film media are eligible for the award, including photographers, cartoonists and newspaper designers. Names and addresses of sponsors or references should be clearly mentioned with email ids and contact numbers. Self nominated entries are also accepted, the release stated. Nominations should include samples of work done during the period January 1, 2018 to December 31, 2018 in the form of links (preferably) or clippings/tapes/CDs. Nominations should have the nominee’s bio-data with complete postal address, telephone, fax numbers and email address for facility of communication. These should be accompanied by a brief explanation of why the candidate is especially deserving of recognition. Media persons sending their entries in regional languages are also urged to send a translation of their work in English, the release added. The media statement further stated that nominations can be sent to The Media Foundation, Flat No. 7, 32 Alipore Road, Civil Lines, Delhi -110054 or emailed to chamelidevijainawards2019@gmail.com. Nominations should reach the Media Foundation not later than February 1, 2019, the release added.